I do not have a green thumb with outdoor plants, but I can keep stuff alive most of the time—unless the grasshoppers take over. Last summer the grasshoppers took over. I had filled my flower garden with lush greenhouse plants, petunias and a few dianthus. Unfortunately, the grasshoppers ate everything down to twigs. The dianthus was the last to succumb, and then it determinedly came back, just in time to freeze down at frost. I was lazy last fall, and never got around to cleaning out my flower gardens. 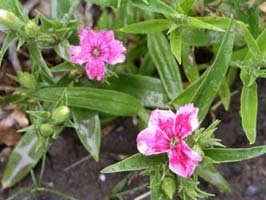 When I finally got around to it this spring, I discovered my dianthus was all green and ready to start up again! I had forgotten that dianthus can be a perennial. It stayed green through several frosts, seemingly impervious to the weather. And today I saw it had two blooms, the first thing to bloom in my yard other than the dandelions. Granted, the blooms are tiny, about thumb-sized, but they are absolutely loaded with buds. After last summer’s grasshopper disaster, I swore I wasn’t going to waste money on greenhouse plants this year. But maybe just a few more dianthus?